Hotchkiss, J. T. and Lesher, R. "Factors predicting burnout among chaplains: compassion satisfaction, organizational factors, and the mediators of mindful self-care and secondary traumatic stress." Journal of Pastoral Care and Counseling 72, no. 2 (June 2018): 86-98. SUMMARY and COMMENT: This is one of two articles in the June 2018 issue of the Journal of Pastoral Care and Counseling relating to burnout among members of the Association of Professional Chaplains [--for the other article, see Related Items of Interest, §I, below]. Burnout has been a topic of two previous Article-of-the-Month features: October 2013 and October 2011. The present research adds not only new findings to the literature but also a potentially valuable theoretical framework and the use of the just-published Mindful Self-Care Scale. It is the authors' thoughtful method itself that particularly recommends this article. Hotchkiss and Lesher hold that their findings "support the theoretical premise, based on Maslow's model, that deficiency motivations [i.e., basic and psychological needs on the lower levels of the pyramidal model] must be met before higher motivations manifest and that compassion satisfaction is an expression of chaplain self-actualization," and "[w]hen chaplains feel a sense of joy and purpose, and have their needs met as conceptualized in the Maslow hierarchy, they can buffer the impact of compassion fatigue (secondary traumatic stress and Burnout)" [pp. 93-94]. One way of understanding this "joy and purpose" is in terms of a chaplains' sense of calling -- "the feeling that a chaplain's work is a calling that they enjoy" [p. 95, and see p. 89] -- which the authors find to be of central importance for reducing burnout risk [--see pp. 93 and 94]. They encourage "[m]indful efforts to celebrate feeling good about doing good" [p. 96], atop addressing practical and organizational issues. "[C]haplains who felt good about helping their clients and worked in a supportive setting tended to take care of themselves better and have lower risk for Burnout" [p. 96]. The article offers a number of suggestions for reducing Burnout, but this reader was especially struck by the observation from their data, made in light of other research, that "Secondary traumatic stress appears less amendable to mindful self-care activities practiced while at work and in the process of everyday life," and so, "necessary interventions may extend beyond individual self-care to include peer or professional counseling" [p. 95]. However, "In contrast, symptoms of Burnout appear to be more amendable to bodily rest, caring for one's self..." [p. 95]. The authors note that Burnout fits a "resource depletion" model of compassion fatigue by which "helpers become worn out, physically and mentally, by exposure to distressed clients and addressing their care needs" [p. 89, and see p. 95]; whereas STS seems to fit a model of "emotional contagion," referring to an "affective process in which a helper, caring for traumatized persons, feel[s] emotional responses parallel to that person's actual or anticipated emotions" [p. 89]. This would seem to underscore the significance of chaplains' utilizing multi-modal strategies for wellbeing. Addressing the limitations of the study, the authors state that their findings' "generalizability is increased by chaplains participating from all 50 states" [p. 96], yet the "low overall return rate of 10.1%" [p. 96] is certainly problematic. Nevertheless, as this reader has pointed out before in our Article-of-the-Month features, a study can contribute substantially to the literature largely by raising productive questions, and the present work would seem to proffer many leads for future investigation, including further testing of its own theoretical model, along with methodological elements that could be brought to bear on samples that would support greater generalization. *NOTE: The dates of data collection were supplied to ACPE Research in a communication from Dr. Hotchkiss and are not mentioned in the published article. CORRECTION: Jason Hotchkiss has communicated that the sentence on p. 96 that begins, "A low overall return rate of 10.1%, may belie selection bias..." should actually read, "A low overall return rate of 10.1%, may suggest selection bias..." [--italics added here for clarification of the change]. The statistics in this article are likely to be challenging to most chaplain readers, but students could be guided to follow the basic narrative of the text, move initially over the technical aspects that they do not understand, and return to the statistical sections once they have the whole picture of the article in mind, to try to appreciate the finer aspects of the methodological process and data analysis. (An explanation of the null hypothesis could be particularly useful.) Figure 2 [p. 93] might also help students see how the statistical details relate to the larger scheme of things. Of course, for any students interested and versed in research, this article contains a rich amount of information. Discussion could begin by clarifying the crucial concepts of Burnout, Secondary Traumatic Stress, and Compassion Satisfaction, along with the ideas of self-care and organization factors. For most CPE groups, the experience of chaplaincy may be new enough that Burnout and Secondary Traumatic Stress could be relatively abstract concepts, but Compassion Satisfaction may be a dynamic that they can identify early on; so that may be a productive area to focus on first. Also, the theoretical framework and its graphic representation in figure 1 [--see above, plus pp. 88-89] should easily engage the group. Do students understand Maslow's hierarchy in the first place? 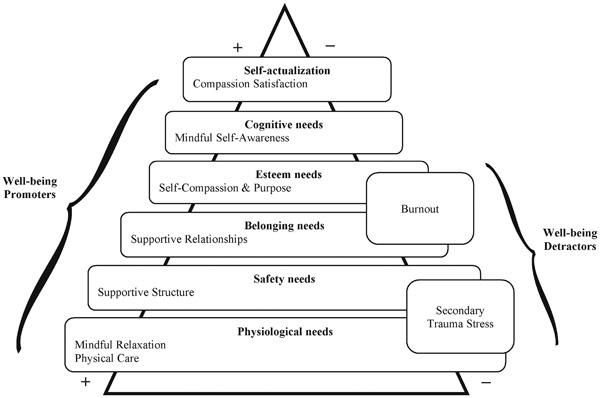 Talk of the theoretical framework might be aided by reference to the specific items of the Mindful Self-Care Scale, which can be found freely online [--see Related Items of Interest, §II, below]. What do students think of the observation that Burnout was not associated with a hospice setting like it was for a hospital setting? Does the authors' mention of the idea of "calling" [pp. 89, 93, 94, and 95] resonate with students? Does it fit will all students' religious traditions or personal perspectives? Finally, has this research provided insights or raised questions that students see as having practical application for themselves? The MSCS is also available directly online from the Mindfulness journal site, along with the abstract and references; and more information may be found on the author's website: www.catherinecookcottone.com. III. Full information on ProQOL may be found on the measure's website at www.proqol.org, including the questionnaire and manual.